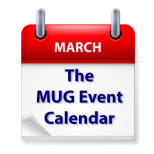 March is off to a fast start on The MUG Event Calendar. Pat Fauquet will present on education to a Virginia group, Jeff Carlson will talk Photoshop Elements with an Illinois group and Adam Christianson will discuss automation in Mac and iOS at a California group. Over in Australia, David Borgnis from FileMaker Australia will present show off their latest software to two different groups. Other topics that the month off include music streaming, iTunes, online businesses, Photoshop and more.